Love is everywhere at FSC at the moment with half the team having anniversaries. Congratulations everyone…and I hope you all get spoilt heaps by your families. and I have chosen butterflies for my focus…hence the sounds of love is in the air. And I send heaps of love to all my teamies who are celebrating! 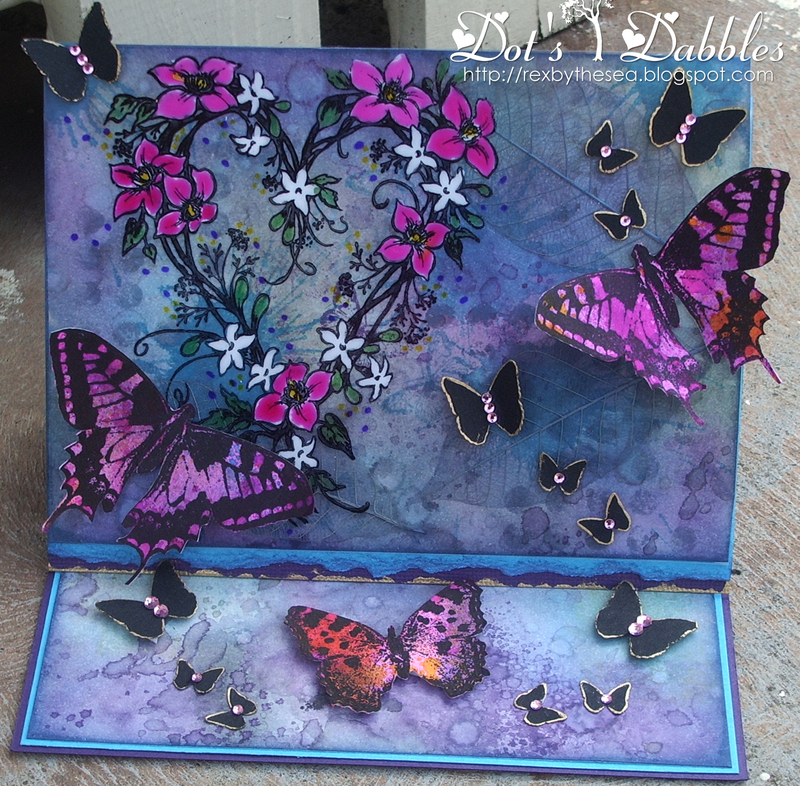 This card has been distressed to the max…in gorgeous pumice stone, black and dusty concord…and to make the whole lot pop…I added highlights of tumbled glass. and coloured with aqualip pens on the flip side. and sprayed up some dylusional sprays, stamped the butterflies, added DI, cut and added in a way that the wings are raised. This is a close up of the inside of the easel card to show you how well the colours go together. I love distressing my inks! For a change of pace I have created a second card in black, white and silver. The centre piece is a reverse embossing technique, where it is cut and joined together with the opposite colour. The flourish highlights are shadow stamped and embossed because it is on shiny silver cardstock. I also had my first go with my new cropodile. I have layered the centrepiece and added lots of bling to bring out the femininity. Thankyou to all my new followers, I hope you enjoy my journey. Everyone is so very different and each person shows us nature at it’s finest. Both cards are beautiful…so rich in contrast and detail. Thanks so much for joining our Black & White challenge at Stamp N Plus. I hope we'll see more of your entries in future challenges. Whoever recieves these cards is going to absolutely love them – great splashes of colour from the butterfiles and flowers! The Design Team are really pleased that you joined us for the Simon Says Stamp and Show Challenge this week – Thank you! Dot, Both cards are GORGEOUS!!! sadly THE GAME's challenge is ONLY black and white…no silver allowed. Your cards are glorious! Thanks for joining our B&W challenge at Stamp N Plus. Totally awesome things with wings inspired cards. Love the purple creation best. Love them both Dot keep looking to see which is my fave but adore them both for different reasons. I'm with Paula though I think the colouring on the first is just sooooo amazing. Ich bin begeistert und ab sofort dein Fan. Beautiful colors and lovely details. Wow, both beautiful, but the first one is my favourite, love the way those butterflies seem to be dancing off the page. Wow Dot! These are both amazing and the colour effects on your easel card are just stunning. Love those psychedelic butterflies too! Sorry for the lack of comments lately – need more than 24 hours in a day! Love all the butterflies, beautiful. Thanks for playing with us at TIOT. Well you have quite blown me away this Sunday afternoon. The detail on the cards are stunning and I love the contrast of one card being a beautiful riot of colour and the second card having that classic colour combination. I love the first card because the colours are so beautiful but I like the second one too as it is very dramatic. They are both gorgeous. Dot these are just stunning cards. 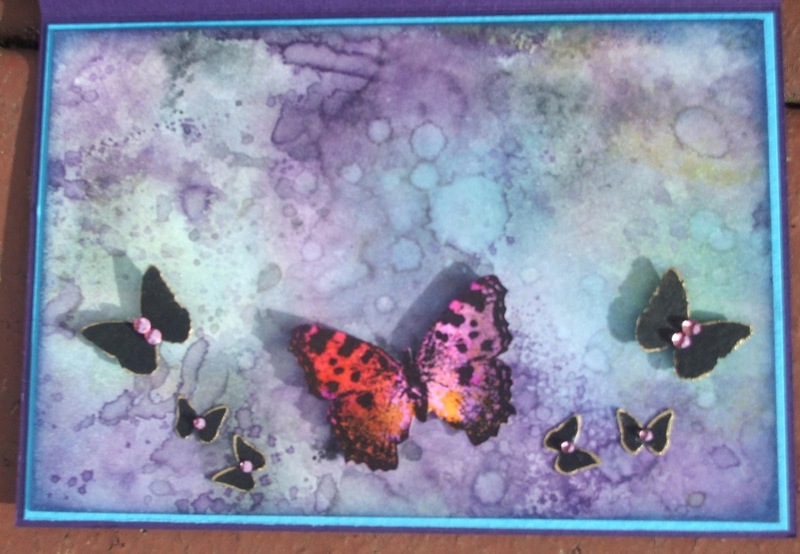 Of course the butterflies are wonderful and the colours superb and the second card is in a class of it's own as far as sophisticated and stylish cards are concerned. Two stunning cards Dot. The colours of the first one are beautiful and the embossing techniques of the second one is perfect. Thanks for playing along with us at Stampavie & More this time. Both of your easel cards are wonderful, cannot decide which I like best. Hi Dot, Love both of these cards, and what a contrast. The colours of the first are gorgeous, love the addition of tose stunning butterflies. The second is is so stylish, always love that colour combo. Well color me drooling over these! The first one is so vibrant and those butterflies look so real! Love these both, Dot! Oh my goodness, I absolutely love your work AND your blog. Wow. This is probably the neatest looking blog I've seen for a while. How creative are you!!! Your cards are just beautiful. Very classy. Love the layering and distressing. My kind of cards. I am at outlawz as well. I'm also a newbie like yourself. Come visit me at my blog. This is so pretty. Love the butterflies, the inside one is my favorite. 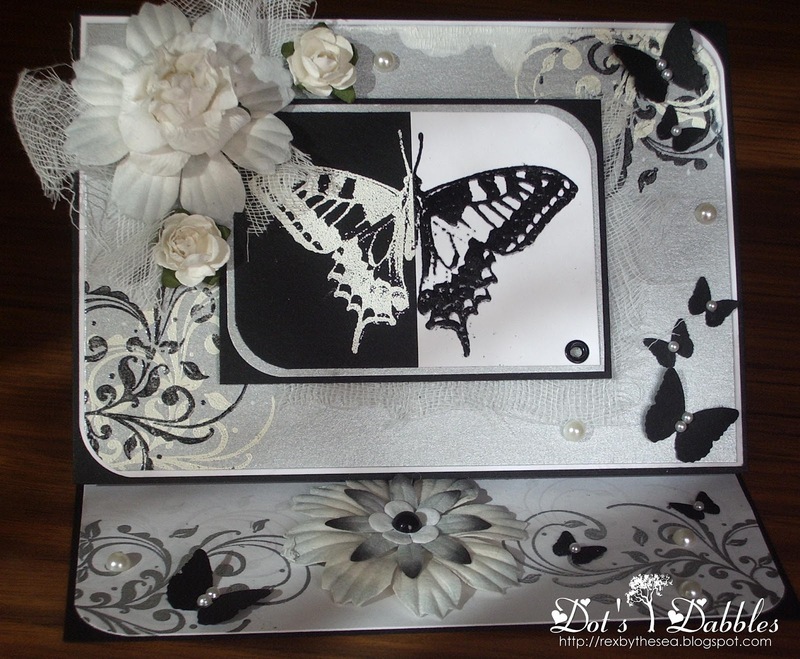 Beautiful cards, love how you did the black and white embossing with the butterfly! Thanks for sharing with us at Stamp N Plus black and white challenge! That is so creative. 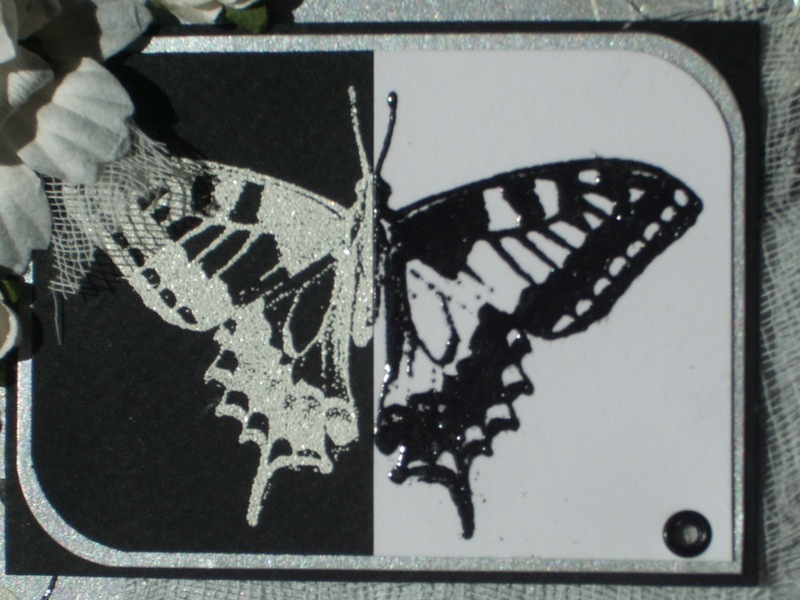 Love the black and white butterfly. Well done. Thanks for joining us at Stamp N Plus. So different and each so beautiful… lovely! love those colours, a beautiful creation.